Chloe’s messenger bag, the PetEgo Contour Messenger Black Label Bag, is my secret weapon. Without it, I could not sneak her into a fraction of the places she goes. It comes in two sizes, and she fits in the larger one (13Hx20Lx10W). That’s the one illustrated on PetEgo’s page for the product; please note that their human model is petite, and the bag is less imposing in real life. It also comes in a sporty orange-and-grey color combination, but I think the all-black option looks more like an computer bag and doesn’t highlight the mesh ventilation panels. It has many good features, but the ones I care most about are the mesh “tower” and a small, zipped hatch in the top panel. The tower can be raised solidly into place with a couple of interior struts. However, I choose not to use them, but to leave the tower zipper open so that Chloe can push the top panel up with her head and look out through the mesh if she wants to. When she’s done gazing and lies down, the top lowers again, returning the bag to its normal shape. The hatch in the top panel could allow her to stick just her head out of the bag (though right now she’s small enough that her shoulders soon follow). I use it instead to poke treats into her bag from time to time. We like her to feel that when she’s in the messenger bag, goodies fall from the sky. Other nice features are the removable pad that lines the bottom of the bag (it tends to get scuffed up while she’s in the bag, but at least once it’s served as a mat for her to lie on at a restaurant’s outdoor seating area) and the poop bag dispenser built into the tiny pocket on the front of the bag. An overarching nice feature is that the bag is very well made (which it should be, at that price). The fact is, owners of really small dogs have it easy. 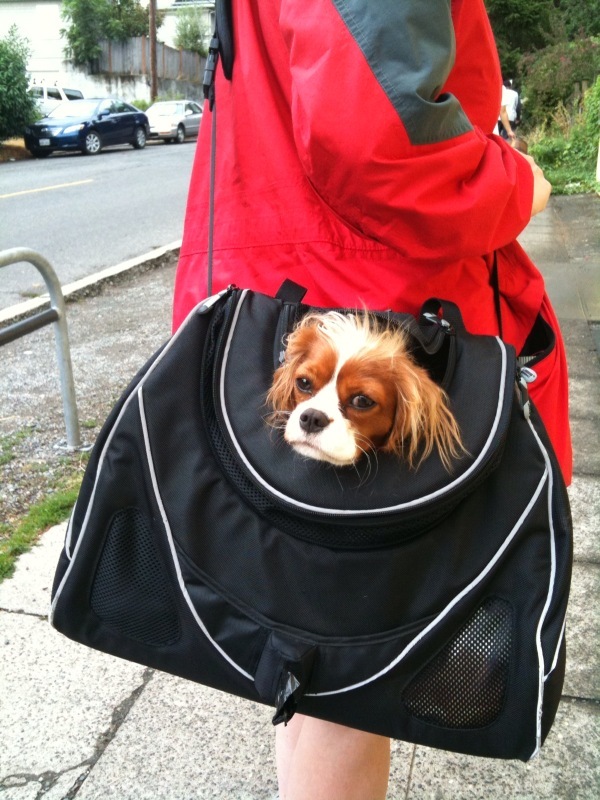 There are lots of stealth bags out there for dogs under 10 lbs., and many of them are very discreet indeed. Look, for example, at the Mia Dog Carrier [no longer available, as of 6/11], Trixie & Peanut’s Tailways Pet Tote, or the unaffordable Charles Nantucket Carrier — who would ever know there was a dog inside? Larger small dogs don’t have as many choices. Maybe I’ll buy a second black messenger bag and save it for when Chloe’s current bag wears out. What if it were discontinued?? I bought one of these bags … and i had a question. There was the two “snappy poles” that attach to the top flap. But there was also another plastic pole in the bag. Do you know what its used for? I couldn’t figure it out. Hello, Jeef! I have one of those poles too, and I believe it’s meant to create a kind of “spine” down the center of the back. When you open the bag, you’ll see a fabric pocket along its back. Behind that pocket is a vertical line of stitching and Velcro. You can slip that extra pole into that vertical channel, securing it with the Velcro-ed flap at the top, so it doesn’t slip upwards. That creates a strong vertical spine, which may be of structural help if you’re using the two snappy poles. I never use them, so I don’t have first-hand knowledge of whether a strong spine would be helpful — but the designers must think it’s a good idea. Hope that helps, and I hope you’re liking the bag — it’s one of Chloe’s essentials. Hi Mary-Alice! PetEgo also markets the Contour Messenger bag on their website as being airline approved. What is your opinion on using it for traveling on the plane? Hi, Carrie! As you can tell, I love this bag — the part you don’t know is that I have, in fact, bought TWO more of them, so that I’ll be prepared if it’s discontinued and Chloe’s current bag wears out (which it’s showing no signs of doing — the wear around the edges is there, yes, but it’s no big deal and hasn’t progressed). I don’t use it for an airplane carrier, however, because of its configuration. It’s wedge-shaped, really, so your dog doesn’t get the benefit of a 4th corner and the internal space that provides — no problem for a short jaunt, but kind of a bummer on an airplane ride. Otherwise, it wouldn’t be a bad choice — the “back” (closest to your body when it’s over your shoulder) is padded, and would serve as the bottom when you tipped the bag to go under the seat. The large messenger bag I use for Chloe is 20″ long at its widest, which is too long for most airplane seat spaces BUT since it’s a wedge, you could put the smaller, top part of the bag under the seat first, so that the 20″ part was closest to you. And there’s plenty of ventilation panels, of course. So — not a terrible choice, but wouldn’t give your pet all the space that’s available under there, and I like to maximize Chloe’s living space on a plane. Oh, dear, I am predictable, aren’t I? But those really are the two bags I like best, unless your pup is small enough to fit in Creature Leisure’s Pet Pilot XL, which is terrific too, and rolls! Your preferred choices are always eye-opening. I probably would not have considered the Sturdibag if not for you! Oh, that’s you! Of course, I remember the pictures you posted of your beautiful Klee Kai and her siblings on Dog Jaunt’s Facebook page! I’m afraid Mochi is indeed too large for the Creature Leisure bag. 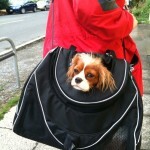 My husband and I recently purchased a large Pet Ego Messenger Bag for our Cavalier King Charles Spaniel puppy, Sophie. She loves it! Her immune system won’t be fully developed until she is four months old (she is three months old today), so the messenger bag is a great way for us to take her on walks and hikes with us without compromising her immune system. It took us a day or so to figure out that spine piece in the bag (the extra rod)–If only I had read the comments on the article here we wouldn’t have spent several days wondering what it was for. It does make the space larger in the bag, and a more sturdy structure, once you install that extra piece. Thanks again for all your hard work–I hope you know it is very much appreciated. I do have a cute picture of her in the bag, but I don’t do Facebook. If you want a copy of the picture (Sophie’s really cute in the bag and my HUSBAND was actually willing to use it), just tell me how to email it to you and I’ll be more than happy to do that. Hi, Jen! I love hearing that one of our favorite carriers is working for you guys as well — and I would LOVE to have a picture of Sophie. May I post it as a Photo Friday, when it comes? My e-mail address is m-a [at] dogjaunt [dot] com. Thank you!! Hey I have a 4 pound Yorkie and we’re going to take him to the Bahamas! Will the Small Messenger be ok! He’s very small! Hi, Sandra — I’m so sorry. This is a hideously late response. The small Messenger bag will work very well as a tote for a pup your pup’s size, but NOT as an in-cabin carrier. It’s just not built for that purpose — it’s an odd triangular shape in the configuration it’d have to be in to be under your seat, and won’t give your pup comfortable head room. I’d go for the small SturdiBag, or the Sleepypod Air, or the small or regular Kobi carrier instead. I bought this bag based on your positive review for my 10 pound chihauhua. The bag was smaller than I expected, so I’m happy I bought the large size. I installed the pole to create the spine down the center of the back. Without this installed, the bag doesn’t really stand up and flops over. We are introducing her to it and treating her to get her adjusted to being carried in a bag. I’m looking forward to putting this to use on some upcoming trips. I’m glad I stumbled on your blog. Thanks! No worries, Flavia — your English is fine! Your pup isn’t that much smaller than Chloe — I’d stay with the larger size, if I were you…. Thank you very much. I will buy the larger one.